After meeting with Holocaust survivors at a gathering in Whippany, some 100 students from three New Jersey high schools pledged to continue telling their stories of survival from now until the year 2045 — a century after the liberation of the Nazi concentration campus. The collective promise came at the end of a two-hour session of the survivors sharing testimony of the events they witnessed or lived through. 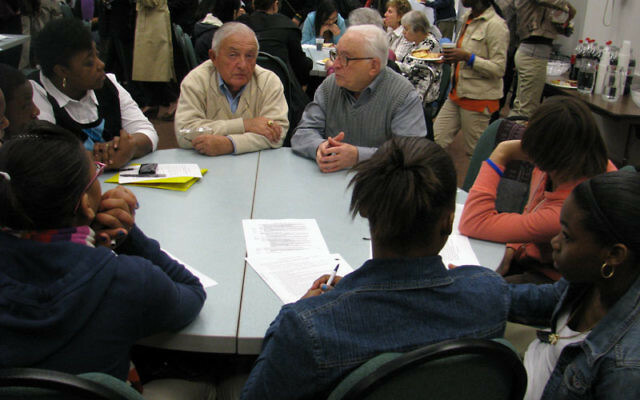 Teenagers from Parsippany High School, Rahway High School, and Weequahic High School in Newark talked across 12 large tables with Jews who had narrowly escaped death at the hands of the Nazis, and two U.S. Army veterans of World War II. 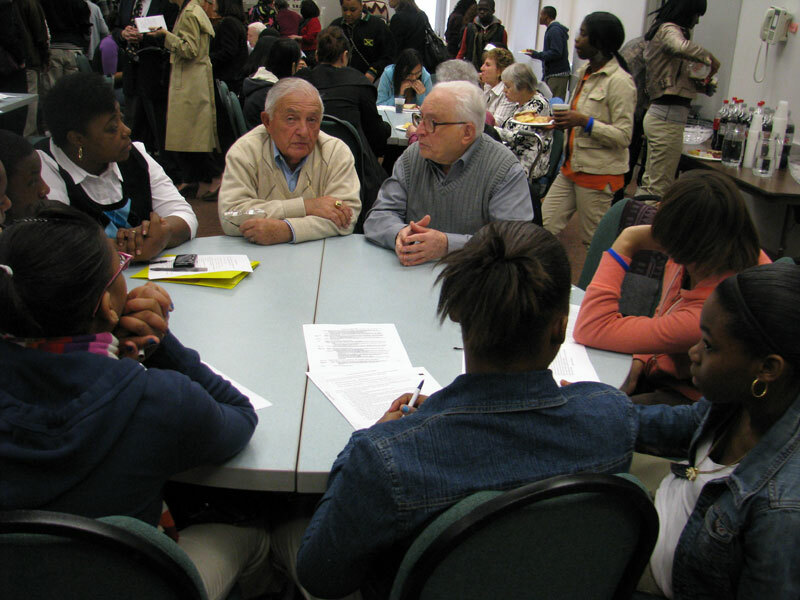 Addressing the diverse group of students — among them black, Latino, Asian, and white youth of many ethnicities — the Jewish senior citizens shared their personal stories of imprisonment, hiding, torture, and narrow escapes as the young people listened intently. “I was shy, I was little, and I was lost, but I was lucky people treated me well,” Hanna Keselman of Springfield told her table of students. Carl Dubovy of Chester told students from Weequahic a harrowing tale. “The Nazis came and they brought us to a camp and they sent my father and my older brother to work in a munitions plant. I was just 11, and they had no use for women and children and old people, so they sent us to Auschwitz. I was on a cattle car. It was the worst moments of my life. For about five days there and you knew you were coming there to be killed. Bea Glotzer of Livingston agreed. The session ended as representatives of the three high schools shared their feelings about their conversations with the survivors and veterans. “Our high school is proud that we came and talked to the Holocaust survivors about their experiences,” said Diane Porter, a member of the class of 2012 at Rahway High School. Then two survivors, Gina Lanceter of Montclair and Ed Bindel of Mountain Lakes, thanked the students. The event was hosted by the Holocaust Council of MetroWest under the ausipices of the New Jersey Commission on Holocaust Education. The Linda and Murray Laulicht Foundation sponsored the program.